Fifteen members of Technology Credit Union rallied Aug. 15 outside the credit unions San Jose, Calif., headquarters to show their opposition to the credit unions proposal to change to a mutual bank charter. Twelve of the 15 members of Technology CU who showed up at last week’s rally to protest the proposed conversion. 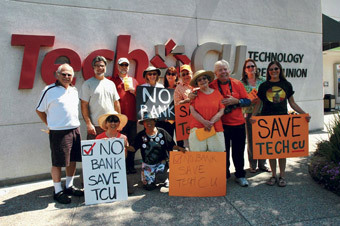 Fifteen members of Technology Credit Union rallied Aug. 15 outside the credit union’s San Jose, Calif., headquarters to show their opposition to the credit union’s proposal to change to a mutual bank charter.